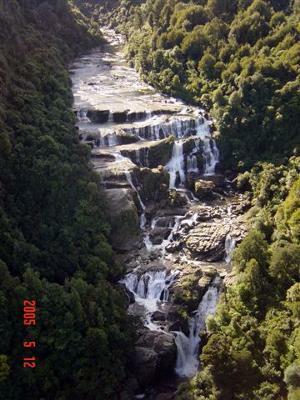 These are the Waitangi Falls in the Ruakituri Wilderness area. The only way to get to these falls is to walk in. It is a no fly area. The Ruakituri River is a popular trout fishing river. I had a look on the W18 Topo map and it says the Waitangi falls are 72m. It takes about three hours walk along the legal access road, from Papuni Station which is on the Ruakituri Road. From Te Reinga to the start of the track you would be looking at an hours drive.